One of the most widely used programs in the world for visualizing and analyzing data is Microsoft Excel. This software is used in almost every industry, not to mention for personal use in households around the world. Small business owners rely on Excel to track hours, finances, and invoices, and large corporations rely on Excel for data analysis, to visualize data, and innumerable other tasks. There is no time limit or deadline to complete the courses. You can access these courses from any mobile device, including tablets, computers, and mobiles, as long as you have access to the internet. Since the lessons in this course are only a few minutes each, it makes it very convenient to stop and start when necessary. This helps to study when you have time, even if you have less than 10 minutes or 15 minutes. The second half of the beginner’s Excel overview, which is only a small part of the beginner course, will cover sheets, which is an entirely different concept than cells. In this section, you will learn how to rename a sheet, delete a sheet, hide and unhide a sheet, and move and copy a sheet. You will also learn how to change the color of tabs. After mastering the beginner’s overview, the rest of the beginner course will go further into these concepts, and then teach details on how to perform basic functions. Each video in the course shows where one can learn more about the concept covered in the course, as well as the difficulty level of the concept. There is also a full explanation of the concept and the instructor of the course visually takes students through each concept step by step on the screen. The MS Excel Intermediate Course will take what you learned in the beginner course and expand upon it. Additionally, this course will teach you more advanced concepts than those that were presented in the beginner course. Like the beginner course, the intermediate course is set up into short modules, and you can watch the module videos on any device that can connect to the internet. The curriculum in the intermediate course is designed for those who work with Excel in the workplace, and it is primarily for those who want to improve their skills with this program. There is a lot of useful information found in this course, and these skills are necessary for anyone who is going into investments, banking, or consulting, and will also be useful for administrators or for those who track or analyze a lot of data. If you are someone who is new to the workforce, you, too, will find that employers are looking for candidates with at least intermediate Excel skills. 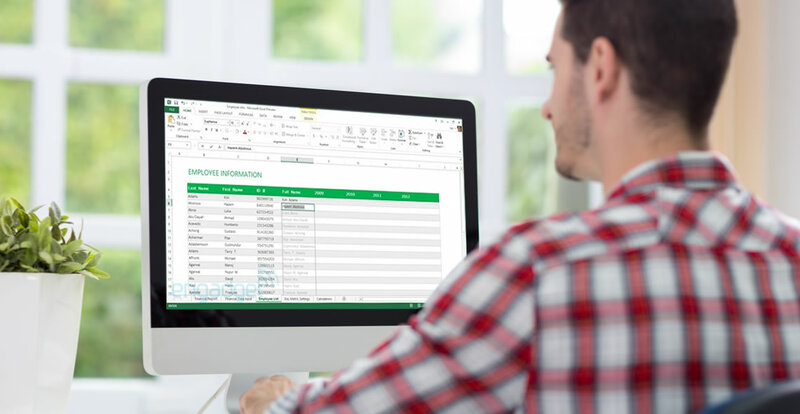 The first several modules of the intermediate Excel course teaches students how to use formulas, including HLOOKUP, VLOOKUP, COUNTIF, and ABS. Data validation information follows this, and students work through several modules, each of which are focused on a type of data validation, such as date, list, and time. The course continues with more information on specific formulas, which include CHAR, CODE, MEDIAN, MODE, and ROUND. Additional information is given on how to manipulate these formulas to meet your needs as an Excel user. The MS Excel Advanced Course is the longest and the most intense of the three Excel courses presented here. However, if you have successfully passed the beginner and the intermediate courses, you should consider yourself fully prepared to begin the advanced course. This course opens with a focus on the VLOOKUP formula, and several modules teach students how to use this function in their work. The course continues with modules on the OR and AND commands, and then focuses on other functions, such as REPLACE, MID, LEFT, and FIND. All three of these courses are designed to improve the knowledge you have with Excel, no matter if you are a beginner, intermediate, or an advanced user. Since these courses are divided into sections, you will also find that they are convenient, and it is possible to learn and study during your free time. Additionally, as the modules in the courses are only a few minutes long, for the most part, you don’t have to take a lot of time during your day to focus on an individual module. Finally, since these courses are available online, again, you can access them from any internet-enabled device.